In the country of Guatemala, half of the children under the age of 5 suffer from malnutrition. "In rural areas, 80 percent of children suffer from chronic malnutrition. Most malnutrition is caused by water-borne illnesses. Operation Baby Rescue is an initiative which provides life-saving treatment to thousands of children battling the effects of malnutrition in impoverished communities. Oftentimes the children are brought directly to the Baby Rescue Center where they are treated for malnutrition, parasites, or other life-threatening illnesses. In some cases, the need is so severe the child must be rushed to a nearby medical facility for extensive care. 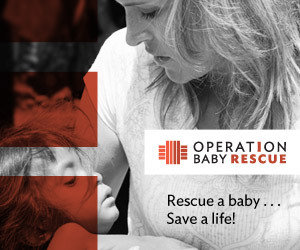 Over 4,000 children have been restored to full health through Operation Baby Rescue." Watch the video and then come up with a project to put feet to their faith and involve the children - and families - in your ministry in joining together to save the lives of babies and children in Guatemala. It is very simple, first, set up your own fundraising page and spread the word - it is very easy, even I was able to do this! :^) (I set up a Grandma's Cookie Jar page for my other blog, grandma's cookie jar) - and involve the children and families in your ministry in raising money for your project! You could have them make photo frames to sell and then donate the money they raised to your project - after all, parents and grandparents do buy photo frames! You could raise money by having an "art show" - have children/families create their own masterpieces and then auction them off to raise money for your project!